My touristing in Chisinau yesterday took me to a cemetery. That isn’t all that unusual since my interest in genealogy often takes me to cemeteries when I travel. But this time I wasn’t visiting the graves of my ancestors, but instead was observing the local “Easter for the Dead” holiday. 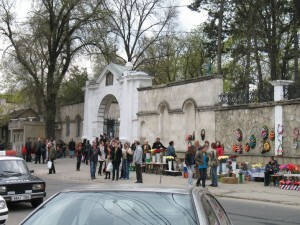 Moldovans going to/from the cemetery on the Sunday after Easter. On Sunday and Monday the weekend after Easter, Moldovan Orthodox Christians flock to the cemeteries where their loved ones are buried, usually in their home villages. The street leading to the cemetery was lined with women, probably also in from the villages, selling flowers for people to bring to the graves. The part of this celebration I found especially interesting was that, in addition to the flowers, the families also brought along picnic lunches. Many of the graves had picnic tables and benches built alongside the grave for this (often in the same marble or stone used on the gravestone). The family gathered around, eating and drinking together, honoring the memory of those who had passed away, sharing time together as a family. And when the family left the cemetery for home, many left plates of candies and breads, often with thin, yellow candles in them, on top of the grave to share with others or perhaps just as a memorial. The sidewalks to the cemetery were filled with people. The main walkway in the cemetery was similarly crowded. But instead of the usual Moldovan crowd-manuvering push-past-people-as-fast-as-I-can attitude, it felt more like a casual Sunday stroll in the park. There were all ages, all types of dress, some with just flowers and some coming in with plastic bags bulging with food and drink. The attitude by many of the graves was solemn, especially one where a Rasputin-like priest was saying a blessing. But the attitude in general was festive, but respectful and not boisterous. Even the small boy who was amusing himself by swinging on one of the arms of a cross at his family’s grave swung in a quietly joyful way without seeming disrespectful. Inside the church there was a service in process, but only the sound of soprano voices singing in harmony drifted out to where those of us without head scarves (and who really didn’t have the right to participate in this ceremony) were standing to listen. As people left the cemetery after their family time of celebration, they seemed unusually generous with the older man and seemingly incapacitated woman in a wheelchair who were begging near the exit gates, giving gifts of both money and food items. I don’t know the theology behind this Orthodox celebration. And I don’t know that if I did know it, I would agree with it. But it seemed to bring families together, honoring those who have gone before them in respectful celebration. I think that’s a good thing. Reminds me of stories I’ve heard of Day of the Dead activities in Mexico. Terry, I know, sounds similar to me too, and they wouldn’t be Orthodox in Mexico, but mostly Catholic. So it can’t be tied to that…must be a cultural thing of some sort? It was really interesting, anyway. I wish I could have gotten some photos, but it seemed too disrespectful.